There are varieties of Rasam. This is one of the popular soup or rasam in Karnataka which is called “Bele Thili Saru”. This can be had as hot soup or with rice. Rasam is very healthy, simple & easy to prepare. Soak tamarind in a 1/4 cup of water for 15, extract the juice. Pressure cook pigeon peas/ dal & turmeric with 2 cup water for 3 whistles. Remove dal from the cooker & mash. Dry roast pepper & cumin seeds & powder it. Add curry leaves, garlic & red chilly fry for a minute. Pour pressure cooked pigeon pea/dal into it. Add water if required to make it watery. Add pepper powder & cumin powder. Bring it to boil & add salt. Boil it for a minute. 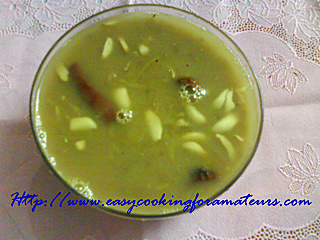 Pigeon pea soup/toor dal rasam is ready to serve hot as soup or over rice. Lovely and healthy rasam , perfect for winter . Wat a comforting dal rasam..
That sounds so comforting n delicious! Looks yummy. love the color.